Also updated the 1984 poster index page. 28 Dec 2014 Put up an upgraded artwork page for the Code Blue cassette compilation and updated its entry in the annotated discography. 20 Dec 2014 Put up a venue image page for (the original) Exit in Chicago and updated its venue description page. 18 Dec 2014 Put up a venue image page for Keystone in Palo Alto CA and beefed up its venue description page. 16 Dec 2014 Put up a venue image page for The Musical Moon in Tallahassee. 16 Dec 2014 Modified the venue image page for Sweetbay Studio B in Tallahassee and beefed up its venue description page. Thanks to Alex Weiss for the clarifications and new info. 15 Dec 2014 Added a previously unlisted Hüsker Dü date: 03 Jun 1985 at Sweetbay Studio B, Tallahassee FL. Also put up a flyer image for the show, as well as a venue description page and a venue image page. Thanks to Peter Schow for the info and Alex Weiss for the flyer image. 28 Nov 2014 Added Greg Norton's 28 Nov 2014 Gang Font gig at Icehouse in Minneapolis to the dates page. 27 Nov 2014 Put up a venue image page for the Odd Fellows Building in Minneapolis. 22 Nov 2014 Put up a performance stills page for the 12 Sep 2014 Bob Mould show at Paradise Rock Club, Boston. 22 Nov 2014 Put up a setlist page for the 16 Jun 1987 Hüsker Dü show at BIG, Torino, Italy, based on this previously unsurfaced recording. Thanks to Lasse W. for the pointer. 19 Nov 2014 Put up a setlist page for last night's Bob Mould Band show at Village Underground in London. Thanks to Jason Narducy and Kieron Perry. Thanks to Opu Anwar, Mike Melville, and Jason Narducy. 14 Nov 2014 Put up a performance stills page and a poster image page for the 12 Nov 2014 Bob Mould show at Het Depot, Leuven, Belgium. 13 Nov 2014 Put up a performance stills page for the 06 Nov 2014 Bob Mould show at Bi-Nuu, Berlin, Germany. 13 Nov 2014 Put up a performance stills page for the 07 Nov 2014 Bob Mould show at Gebäude 9, Köln, Germany. Thanks to Stefan Kullik and Rainer Driemeyer. Thanks to Stefan Kullik for the pointer to the Rockpalast photo set (Wangels) and to Michael Kaiser for the Amsterdam photo. Thanks to Ulf Wholigan and Jason Narducy. 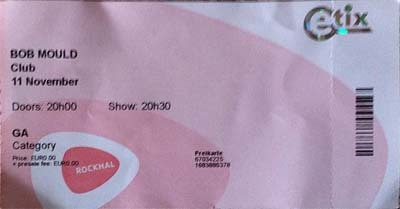 12 Nov 2014 Corrected an entry on the dates page based on newly obtained info: the 29 Dec 1992 Nova Mob show in Saarbrücken, Germany was at a venue called Ballhaus, not at Gym as indicated in the print ad that lists the dates for this tour. Also put up a venue description page for Ballhaus. Thanks to Ulf Wholigan and Chris Hesler. 08 Nov 2014 Put up a setlist page for last night's Bob Mould Band show at Gebäude 9 in Köln. Thanks to Jason Narducy and Rainer Driemeyer. 07 Nov 2014 Put up a setlist page for last night's Bob Mould Band show at Bi-Nuu in Berlin. Thanks to Jason Narducy. 01 Nov 2014 Fixed a broken link to VZD's in Oklahoma City and put up a venue image page for the club. 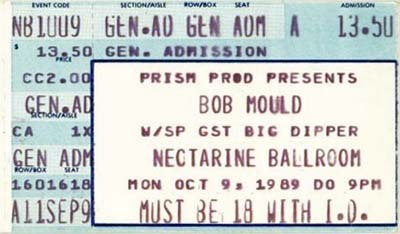 28 Oct 2014 Put up a setlist page for the 28 Oct 1990 Bob Mould Band show at McNeil Room, RPI Student Union, Troy NY (replacing a dead link to an external site). Thanks to David Israel. 26 Oct 2014 Put up a setlist page for the 23 Oct 2014 Grant Hart (backed by ESC Life) show at Klub Močvara, Zagreb, Croatia. Thanks to Perka Neboderka. 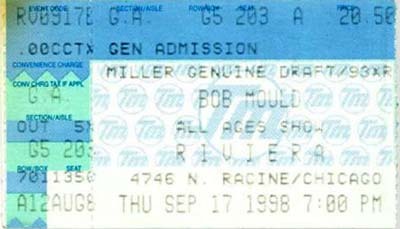 17 Oct 2014 Put up a performance stills page for the 10 Oct 2014 Bob Mould show at Vaudeville Mews, Des Moines IA. Thanks to Peter Bissinger. 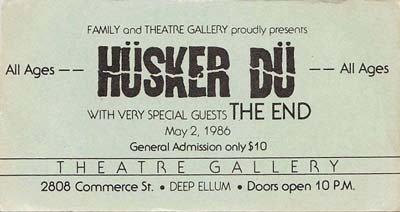 17 Oct 2014 Put up a handbill image for The 15 Jun 1984 Hüsker Dü gig at G.S. Vig's, Madison WI and updated the 1984 poster index page. 16 Oct 2014 Put up a setlist page for the 14 Oct 2014 Grant Hart (with backing band) show at Rhiz, Vienna, Austria. Thanks to Heinz Goedl. 07 Oct 2014 Corrected a Nova Mob date after taking a more careful look at the flyer: should be 19 Apr 1991 at Bloom, Mezzago, Italy (the '4' looked like a '6' at first glance). This meshes with the other dates from that time period. Also put up a poster image for the Skopje show. 06 Oct 2014 Put up a venue description page for Mississippi Nights (St Louis); the club has been defunct since 2007 and though its website outlived it for a time, it too has now expired. 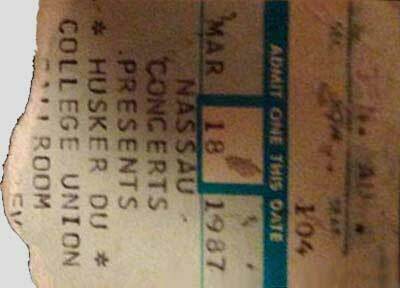 03 Oct 2014 Learned that the 20 Feb 1986 Hüsker Dü gig originally scheduled for Northwestern University was indeed canceled, due to university "restrictions" on use of the venue. 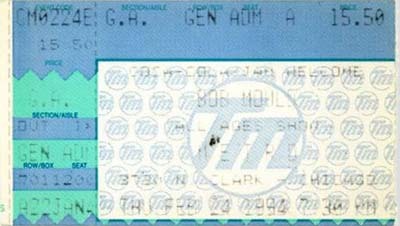 The cancellation did not occur until after the tour t-shirts showing the date had been printed, which led to the confusion (Hüskers ended up playing in St Louis that night). Thanks to Jeff Cory for the clarification. 03 Oct 2014 Put up a setlist page for the 19 Sep 2014 Bob Mould Band show at Old Rock House in St Louis. Thanks to Ryan King. 30 Sep 2014 Put up a setlist page for the 03 Jul 2012 Bob Mould Band show at Summerfest (US Cellular Stage) in Milwaukee. Thanks to Edward Haack for the Fillmore poster image. 29 Sep 2014 Put up a performance stills page for the 23 Sep 2014 Bob Mould Band show at Neptune Theatre, Seattle. Thanks to Cat Rose and Andy Nystrom. Thanks to Sumant Ranji and Jason Narducy. 27 Sep 2014 Previously unlisted Grant Hart date added: 27 Sep 2014, 7th St Entry, Mineapolis (opening for Sebadoh). Thanks to Rüdiger Höckel. Thanks to Jason Narducy and Andy Nystrom. 21 Sep 2014 Put up a setlist page for the 17 Sep 2014 Bob Mould Band show at Turner Hall Ballroom in Milwaukee. Thanks to John Mulhouse. 20 Sep 2014 Put up a performance stills page for the 05 Sep 2014 Bob Mould Band show at Theatre of the Living Arts, Philadelphia. 17 Sep 2014 Put up a setlist page for the 15 Sep 2014 Bob Mould Band show at the Beachland Ballroom in Cleveland. Thanks to Brian Schumacher. Thanks to Jason Narducy for the Bowery Ballroom setlists. 13 Sep 2014 Put up a setlist page for the 12 Sep 2014 Bob Mould Band show at the Paradise in Boston. 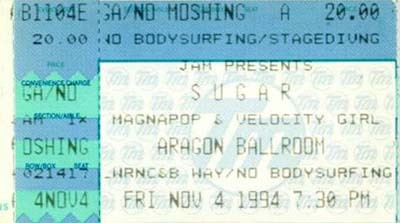 09 Sep 2014 Embedded the YouTube video of Bob Mould's 09 Sep 1994 interview on the Rage program (TV38, Boston) in the show's entry in the annotated discography. 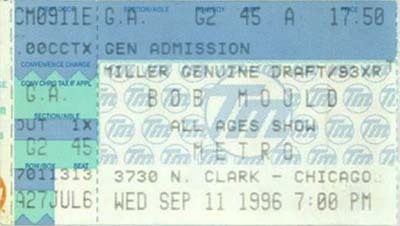 07 Sep 201nnn Put up a setlist page for the 06 Sep 2014 Bob Mould Band show at the 9:30 Club in DC. Thanks to Jason Narducy. 06 Sep 2014 Put up a setlist page for the 05 Sep 2014 Bob Mould Band show at Theatre of the Living Arts, Philadelphia. Also put up a setlist page for last night's show at the Entry, a venue description page for WUST, and a new Riot Fest flyer image. Thanks to Jason Narducy for the Entry setlist. 15 Aug 2014 Previously unlisted Grant Hart date added: 07 Aug 2014, St Georg Kirche, Haldern Pop Festival, Haldern, Germany. Grant also appeared as a guest with Patti Smith 09 Aug on the mainstage. Put up a venue image page for St Georg Kirche. Thanks to Rainer Driemeyer for the info. 15 Aug 2014 Put up a venue image page for Jackpot Saloon and Music Hall, Lawrence KS. Also fixed a broken link to the Jackpot website. 11 Aug 2014 Added DVD release date (12 Aug 2014) and running time info to the annotated discography entry for Every Everything: The Music, Life & Times of Grant Hart. 09 Aug 2014 Upgraded the venue description page for Club 950 Lucky Number (Chicago) and added a venue image page. Thanks to Aadam Jacobs for clearing up confusion over which images depicted which incarnations of the club. 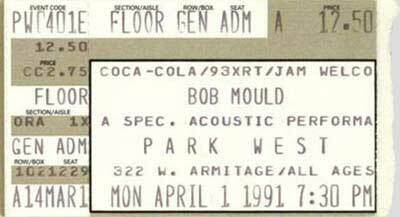 02 Aug 2014 Previously unlisted Bob Mould date determined: 11 Nov 1989, Forum North Lounge, Grinnell College, Grinnell IA. Put up a setlist page for the show, as well as a venue description page and venue image page for the Forum/North Lounge. Thanks to Greg Phillips. 29 Jul 2014 Put up a setlist page for the 26 Jul 2014 Bob Mould Band show at Cat's Cradle, Carrboro NC (Merge 25 Festival). Thanks to Greg Phillips. 26 Jul 2014 Previously unlisted early Hüsker Dü date determined: 20 Apr 1979, Cochran Lounge, Macalester Student Union, St Paul MN. Thanks to Dave Collins. 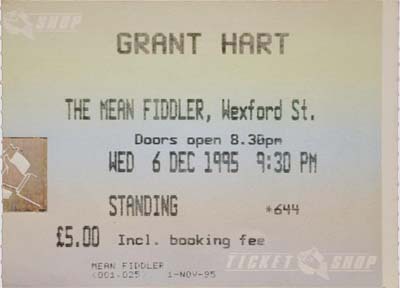 19 Jul 2014 New Grant Hart date announced: 21 Aug 2014, Heimathafen Neukölln, Berlin. Grant will be performing The Argument, backed by the band stargaze. More info here and here. Thanks to Silke Müller. Also put up a venue description page for Camden Monarch, replacing a long-dead link. 09 Jul 2014 New Bob Mould Band fall date announced: 18 Nov 2014, Village Underground, London. More info here. Thanks to Al Millington for the pointer. 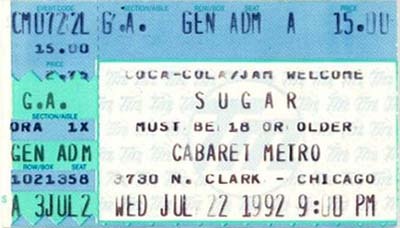 05 Jul 2014 Put up a corrected setlist page for the 05 Jul 1993 Sugar show at Brixton Academy, London. Also added some notes to the description of the live audience tape listing the missing songs. Thanks to Albert Munn and Kieron Perry. 28 Jun 2014 Put up a venue image page for JB's Down Under, Kent OH. 26 Jun 2014 Specific date for Grant Hart's performance at Free State Festival in Lawrence KS has been determined to be 26 Jun 2014 (tonight), in conjunction with a screening of Every Everything. Grant will be performing with a backing band. 24 Jun 2014 Put up a setlist page for the Bob Mould Band show last night at Millennium Park in Chicago. 24 Jun 2014 Venue for Bob Mould's 26 Jul 2014 Merge 25 Festival show has been identified as Cat's Cradle, Carrboro NC. Updated the dates page and put up a poster image. 12 Jun 2014 Added Bob Mould's 30 Aug 2014 show at the Minnesota State Fair to the dates page and put up a poster image. Ticket info here. 11 Jun 2014 Upgraded the venue description page and added a venue image page for Niko's in Milwaukee. 07 Jun 2014 Added Bob Mould's little-publicized 06 Jun 2014 gig at Fitzgerald Theater (St Paul MN) to the dates page. Also put up a setlist page and a performance stills page. Bob was backed by John Munson & the Witnesses. The show was recorded for Wits Radio and is scheduled to air 08 Jun 2014. Thanks to Justin Wood and Peter Nikolai. 03 Jun 2014 Added tonight's Bob Mould instore performance at Amoeba Music in Hollywood to the dates page More info here. 28 May 2014 Added the track listing to the Beauty & Ruin entry in the annotated discography and added the song titles to the titles page. Also uploaded the Beauty & Ruin one-sheet to the press releases page. Thanks to John Hogan for the Grant set. 26 May 2014 Put up a venue image page for Bloom, Mezzago, Italy. 26 May 2014 Put up a flyer image for the 19 Jun 1991 Nova Mob gig at Bloom, Mezzago, Italy, and added this previously unlisted date to the dates page. Also updated the broken link to the Bloom website. Thanks to Sandro Besana. 25 May 2014 Upgraded the artwork page for the Calm Before The Storm bootleg audio CD. 25 May 2014 Put up a performance stills page for Grant Hart's show last night at Bowery Electric, NYC. Thanks to Brad Cohan. Also updated the 2014 poster index page. 22 May 2014 Added a dates page entry for Bob Mould's performance at Hifi Bar, NYC ("20 Years of Stuto," a private benefit for bartender Rhea Buckner). Put up a performance stills page, a setlist page, and a flyer image page for the gig. Added "Suspect Device" (performed by Bob Mould and Ted Leo) to the cover songs page and the song titles page. 22 May 2014 Added a newly announced Grant Hart date: 25-29 Jun 2014 (exact schedule TBA), Free State Music Festival, Lawrence KS (screening of Every Everything, plus live performance, Q&A with Grant. Also put up a flyer image for the festival. Thanks to Chantal Latchford for the pointer. 22 May 2014, Grant Hart, Davis Square Theatre, Somerville MA. More info here. 19-21 Sep 2014, Bob Mould Band, Riot Fest, Denver. More info here. Also put up a flyer image for the Denver Riot Fest date and updated the 2014 poster index page. 08 May 2014 Upgraded the venue description page and venue image page for Saltlageret in Copenhagen (new photos, more background info). 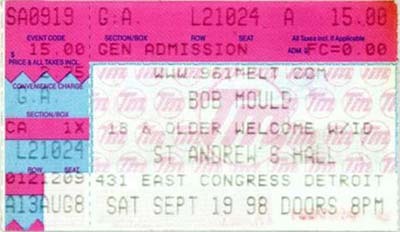 Thanks to Lasse W.
07 May 2014 Added a newly announced Bob Mould date: 06-07 Sep 2014, Riot Fest, Toronto. More info here. 04 May 2014 Put up a venue description page and a venue image page for the now defunct Supper Club in NYC. 01 May 2014 Put up a venue image page for Jay Pritzker Pavilion, Millennium Park, Chicago. 12 Jun 2014, Stage on Herr, Harrisburg PA (solo gig). More info here. 23 Jun 2014, Jay Pritzker Pavilion, Millennium Park, Chicago (free show). More info here. 29 Apr 2014 Upgraded the venue description page for Duff's Downtown (Minneapolis) and added a venue image page. 27 Apr 2014 Added a newly announced Bob Mould date: 13 Jun 2014, Analog-A-Go-Go, Rehoboth Beach DE. More info here. 21 Apr 2014 Added a newly announced Grant Hart date: 25 Apr 2014, Mid West Music Fest, Winona MN (screening of Every Everything, plus live performance, Q&A with Grant. More info here. Thanks to Gorman Bechard. 17 Apr 2014 Added a newly announced Grant Hart date: 24 May 2014, The Bowery Electric, NYC. More info here. Thanks to John Loughney for the pointer. 15 Apr 2014 Put up a venue image page for McAlister Auditorium, Tulane University, New Orleans. Also put up a setlist page for the Carnegie Hall gig, and added "Fakin' It" to the songs covered page and the song titles page. 10 Apr 2014 Put up a venue image page for The Pit, Terneuzen NL. 09 Apr 2014 Put up a venue image page for Markthalle, Hamburg. 07 Apr 2014 Put up a performance stills pages for Bob Mould's two Workbook 25 shows last month at City Winery in NYC: 07 Mar 2014 and 08 Mar 2014, and added their links to the dates page. 07 Apr 2014 Put up a placeholder artwork page for Bob Mould's upcoming Beauty & Ruin album. 27 Mar 2014 Put up a setlist for Bob Mould's two-song performance as part of a panel discussion during SXSW, 13 Mar 2014. Thanks to Dave Dewey. 26 Mar 2014 Put up a limited setlist for the 23 Mar 1984 Hüsker Dü gig at The Rat in Boston. 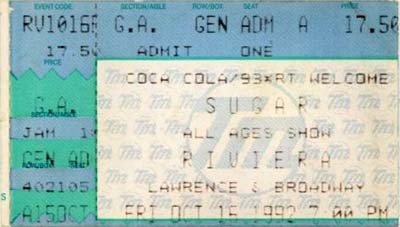 Hüskers opened for R.E.M., and their own set remains undocumented, but Bob and Grant guested with R.E.M., and those two songs are shown on the setlist page. One, "The Lion Sleeps Tonight," was also added to the list of songs covered (the other song, "Paint It Black," was already listed). 14 Mar 2014 Added two new entries to the Songs Covered by Hüsker Dü page: "Puff, The Magic Dragon" and the Beatles tune "Rain," both performed by Grant Hart, Bob Mould, and Dave Pirner at the 21 Dec 1985 Garage D'Or (Minneapolis) instore. Also added these titles to the song titles page, along with "The War," a new Bob Mould song he's been featuring lately in live performances. Thanks to John Loughney and Travis Vande Berg. 07 Mar 2014 Added a previously unlisted Hüsker Dü instore performance, 21 Dec 1985 at Garage D'Or Records in Minneapolis, to the dates page and put up a print ad image. 06 Mar 2014 Added a preliminary entry to the annotated discography for the Grant Hart LP/DVD package, Every Everything And Some Something, to be released 19 Apr 2014 on MVD, a Record Store Day exclusive. Also put up a placeholder artwork page and updated the summary discography. 06 Mar 2014 Added Greg Norton's 08 Mar 2014 gig with The Gang Font at Shapeshifter Lab in Brooklyn to the dates page and put up a flyer image. 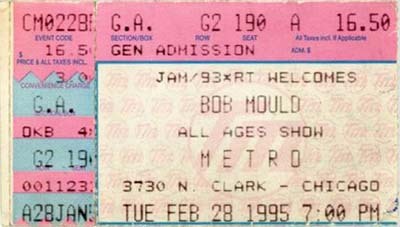 06 Mar 2014 Put up a handbill image for Bob Mould's 27 Feb 2014 gig at Great American Music Hall in SF and updated the 2014 poster index page. 06 Mar 2014 Put up a setlist page for Bob Mould's 04 Mar 2014 Workbook 25 show at the Women's Club in Minneapolis. Thanks to Jason Narducy. 05 Mar 2014 Added a placeholder entry to the annotated discography for the just-announced new Bob Mould album, Beauty & Ruin, to be released 03/09 Jun 2014 on Merge Records. Also updated the summary discography. 05 Mar 2014 Put up a venue image page for Nottingham Cooperative, Madison WI, and pointed one broken dates page link to its Wikipedia entry. 05 Mar 2014 Put up a performance photos page for Bob Mould's 27 Feb 2014 Noise Pop gig at Great American Music Hall, San Francisco. 04 Mar 2014 Put up a setlist page for Bob Mould's 27 Feb 2014 Noise Pop gig at Great American Music Hall, San Francisco. 23 Feb 2014 Added a dates page entry for Grant Hart's performance last night at the Wilma Theatre in Missoula MT, in conjunction with a screening of Every Everything at the Big Sky Documentary Film Festival. Also put up a photo page for the performance and a venue image page for the Wilma Theatre. 23 Feb 2014 Added Bob Mould's newly announced SXSW show to the dates page: 13 Mar 2014, Parish, Austin. 20 Feb 2014 Put up a venue description page for the Boathouse in Norfolk, replacing a long-dead link (the club closed in 2003 and was demolished in 2011). Also put up a venue image page for the club. 16 Feb 2014 Added the May 2914 Bob Mould gig at Sasquatch to the dates page and put up a flyer image for the gig. 16 Feb 2014 Added the latest YouTube trailer to the Every Everything entry in the annotated discography. 12 Feb 2014 Put up an upgraded artwork page for the NME The Mutha Of Creation freebie cassette compilation and updated its entry in the annotated discography. 12 Feb 2014 Corrected the venue for Bob Mould's 27 Feb 2014 Noise Pop gig; it's actually at Great American Music Hall. Also fixed the broken link to the GAMH website in several places on the dates page (venue is now owned by Slim's Presents). Thanks to Tim Tonooka for providing the date and venue for the SF photo, and to Stephen R. Mingle for doing the same for the Lawrence KS photo. 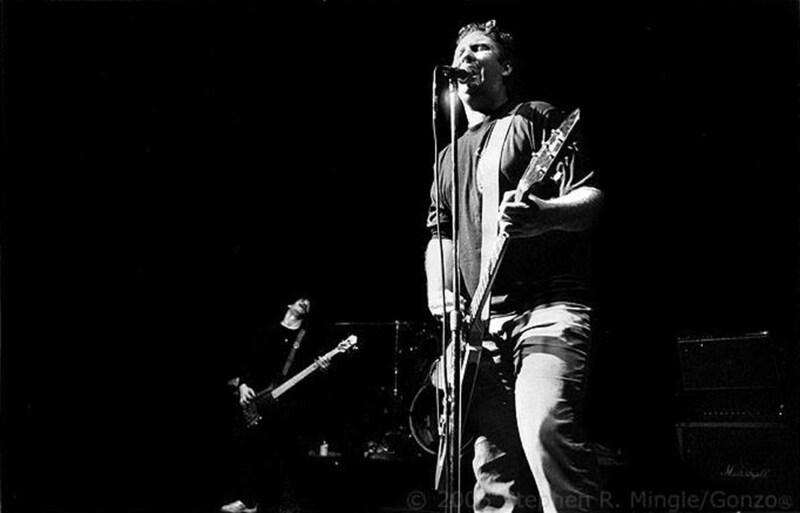 31 Jan 2014 Added a new photo to the performance stills page for the 01 Dec 1984 Hüsker Dü gig at Lawrence Opera House, Lawrence KS. Thanks to Stephen R. Mingle. 28 Jan 2014 New Grant Hart date announced: 16 Mar 2014, Cinema Grill, New Hope MN. Put up a venue image page for Cinema Grill. Thanks to James Lindbloom. 27 Jan 2014 Upgraded the flyer image for the 30 Jan 1985 Hüsker Dü shows at 1st Ave.
27 Jan 2014 Put up a couple of flyer images for the Bob Mould Band 05 Sep 2013 show at Doug Fir Lounge, Portland OR, and updated the 2013 poster index page. Bob Mould, Malone NY, 16 Oct 1964. Greg Norton, Grant Hart, Bob Mould, school picture composite. Bob Mould, Malone NY, 1977-78. Thanks to Peter Neidhardt for the pointer to the 1978 Bob Mould high school yearbook pictures. 20 Jan 2014 Put up a venue description page for Studio 29 in Austin TX, replacing a dead link. Also put up a venue image page for the club, and a flyer image for the 19 Jan 1983 Hüsker Dü gig there. The flyer confirmed the date of the gig, previously uncertain. 19 Jan 2014 Put up a performance stills page for the 29 Dec 1984 Hüsker Dü show at Maxwell's, Hoboken. Thanks to David McKenzie. 18 Jan 2014 Put up a performance stills page for the 11 Apr 1986 Hüsker Dü show at Maxwell's, Hoboken NJ. 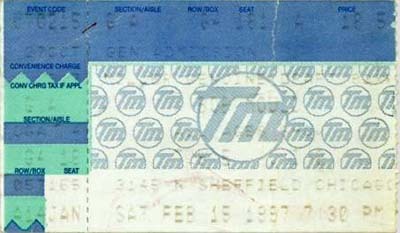 17 Jan 2014 Put up a photo page for the 25 Jan 1983 Hüsker Dü show at Crystal Pistol, Tulsa. Thanks to Greg Sewell. 16 Jan 2014 Put up a performance stills page for the 09 Feb 2006 Bob Mould gig at The Casbah in San Diego. Thanks to Eric Rife for allowing the use of his photo. 08 Jan 2014 Added Bob Mould's 31 Mar 2014 gig at Carnegie Hall (participating in the Paul Simon tribute) to the dates page. 07 Jan 2014 Put up a venue image page for The Miller, London. 03 Jan 2014 Added a few tidbits to the venue information page for Powerhouse (Birmingham UK), based on info provided by Mark Rose. 27 Dec 2013, 1st Ave, Minneapolis. 28 Dec 2013, Turf Club, St Paul. Also put up a setlist page for Grant's Turf Club walk-on. Thanks to John Mulhouse. 03 Jan 2014 Updated the annotated discography entry for Land Speed Record to specify a tentative release date of 17 Jan 1982. Thanks to Thomas Schrewe.